The 2018 Australian Ministerial (AUSMIN) meeting took place in California in July, allowing US and Australian foreign and defence officials to consult as part of the ANZUS alliance. 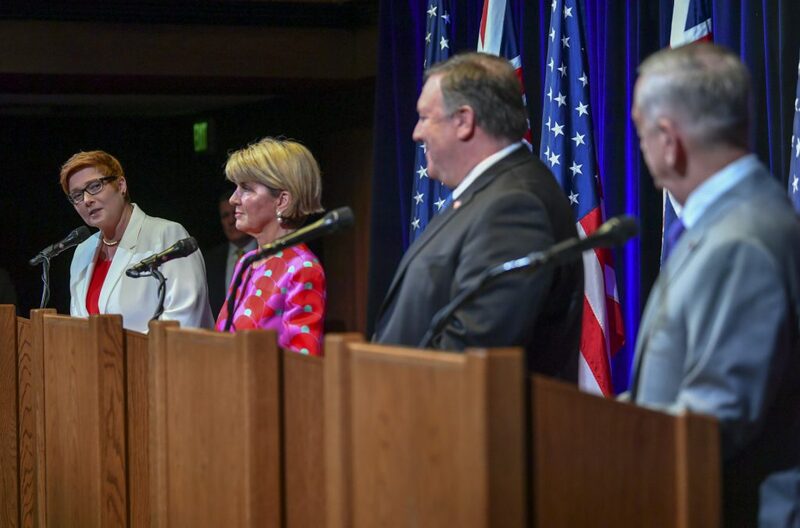 In late July, Australian Foreign Minister Julie Bishop and Defence Minister Marise Payne met with their US counterparts in California as part of the AUSMIN meetings. The meetings are an annual event held between high-level defence, intelligence and foreign policy officials from both nations to outline joint responses and strategies to deal with events in the region. This year’s conference went off largely as expected with agenda items covering economic and security issues in the Indo-Pacific region. However, the increasing trade and security tensions between Beijing and Washington and China’s military and diplomatic expansion have expanded the role of AUSMIN in ensuring US dominance is retained in the region. AUSMIN was established in 1985, replacing and expanding on its predecessor, the ANZUS Council of Foreign Ministers. Under the ANZUS security agreement between Australia, New Zealand and the US, this Council served as the primary forum conducted within the ANZUS framework. However, after the suspension of US security obligations to New Zealand under ANZUS following New Zealand’s refusal to allow a port visit of a US nuclear-armed destroyer in 1985, AUSMIN emerged and remains ANZUS’s most important annual forum between Australian and US officials. Alternating location between Australia and the US, this year’s meeting took place at the Hoover Institution, a public policy think tank at Stanford University in California. Held over the course of two days, AUSMIN 2018 culminated in a joint statement that emphasised defence and technology cooperation and joint multilateral economic development, as well as to jointly ‘oppose actions that seek to undermine the international rules-based order’ and to advocate for ‘strong and deepening engagement in the Indo-Pacific’. While recent AUSMIN meetings have culminated in similar joint statements and resolutions reaffirming security arrangements and abiding by international law, the focus on a ‘free and open’ Indo-Pacific region has been a recurring feature of AUSMIN meetings over the past decade. US Defence Secretary Jim Mattis stated after AUSMIN 2018 that both Australia and the US will ‘walk the walk in the Indo-Pacific’ against increasing assertiveness from Beijing and the intensifying militarisation of the South China Sea. Despite the somewhat predictable outcome of AUSMIN meetings, in recent years the unpredictability of President Donald Trump has cast a shadow over AUSMIN and the broader ANZUS alliance. While US Secretary of State Mike Pompeo reaffirmed the ‘rock solid’ nature of the alliance, Australian policymakers have been increasingly concerned over the past 18 months. Earlier this year, Australian Foreign Minister Julie Bishop spoke in London about how there is an ‘increasing tendency for nations to take a one-sided, unilateral approach to some of their international interests, including economic interests.’ The unpredictability, increasing unilateralism and lack of policy direction under the Trump administration has meant that Canberra has begun to doubt the stability of Washington’s position as the de facto leader of the international rules-based order. It has also been increasingly concerned about the seemingly endless and very public staffing changes in Washington’s most important positions – for instance, the lack of nominations for Assistant Secretary of State for East Asian and Pacific Affairs or US Ambassador to Australia. There has also been growing concern with increasing belligerence from Beijing, which has accompanied the growth of US unilateralism. 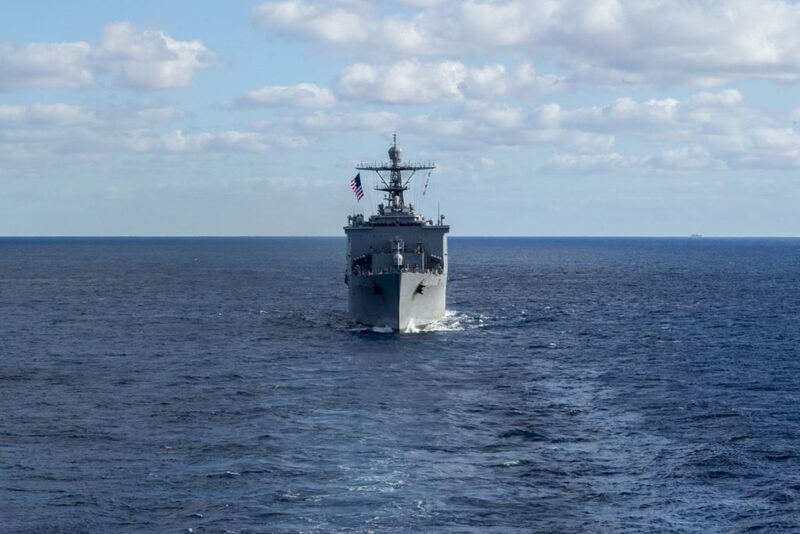 While the final AUSMIN joint statement did express a commitment to step up efforts against military expansion in the South China Sea, Washington has been slow to respond to it or Beijing’s expanding economic diplomacy in the South Pacific. However, this AUSMIN was the first for newly appointed Pompeo, who replaced Secretary Rex Tillerson in March. A China hawk, Pompeo caused some concern in Beijing and Washington with his inflammatory statements on China’s growing power and President Xi Jinping. As economic and trade relations between China and the US become increasingly tense, Canberra will closely watch how Pompeo will continue acts towards Beijing’s creeping influence in the Indo-Pacific. 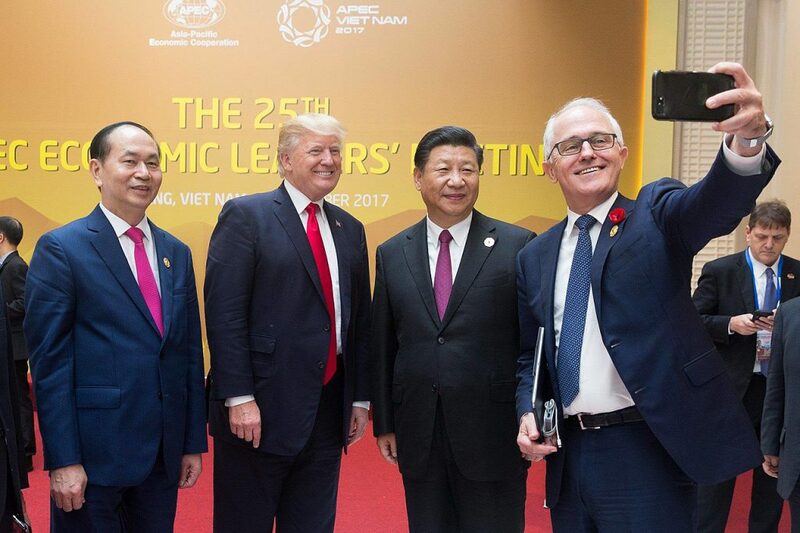 The simmering tensions between the US and China place Australian policymakers in a precarious position – whether to side more with an increasingly hawkish and unpredictable Trump administration, or with Beijing’s important economic and trade partnership. This would have broad-reaching consequences, particularly in the Indo-Pacific, where Canberra arguably remains Washington’s most loyal partner. If the administration continues to leave important regional political positions unfilled and fails to develop a coherent strategy in the region, there is a risk that Canberra could be forced to choose between the two, particularly as its two important partners clash over trade and strategic issues. While there has been much commentary about whether Australia will have to make the choice, ANZUS has near universal acceptance and support in both the US and Australia. Canberra may not necessarily be forced to choose between Washington and Beijing, but US unpredictability means that AUSMIN and the ANZUS alliance more broadly may suffer from differences that will take years to reconcile. This precarity may also mean that Australia (through AUSMIN) could be forced to participate in more aggressive actions against China to assert their shared vision of a ‘free and open Indo-Pacific’, including participating in freedom of navigation operations in the South China Sea. Even though both Australia and the US have expressed a shared commitment to international law and upholding the rules-based order, Australia remains highly dependent on the US for security and a hawkish State Department and Pentagon may pressure Australia to contribute more to the alliance militarily and to participate in more aggressive military operations. While Secretary Mattis emphasised that Australia was not being pressured to participate, tensions with China and North Korea may force Washington to change their outlook. To more effectively deal with North Korea and counter Beijing’s influence, Washington may look at the possible expansion of AUSMIN to include new players or focus more heavily on joint military operations, or the enlargement of the Quadrilateral Security Dialogue’s membership and role in regional security. While this may reinforce criticisms of Australia’s unquestioned military and intelligence support to the US, these approaches may be necessary as diplomatic and legal strategies in the South China Sea begin to falter. Nonetheless, while AUSMIN remains a critical part of Australia’s defence and security agendas, in the coming years it may provide it – and the Indo-Pacific more broadly – more problems than solutions, if key issues are not reconciled.